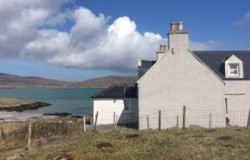 Mo Dhachaidh is a renovated croft house situated on the North East side of Eriskay. Our 4 bedroom house sleeps 8 people looking out towards where the famous'Polititian' finally laid to rest. The accommodation is surrounded by beautiful scenery and beaches with the local shop, Co Chomunn Eirisgeidh and Am Politition Bar within walking distance. Staying in Eriskay allows you to make day trips to other connecting islands including Barra which is only a 30 min ferry journey away. Come and enjoy our spacious family home which will provide a unique island experience together with a secluded beach only a stone throw away!